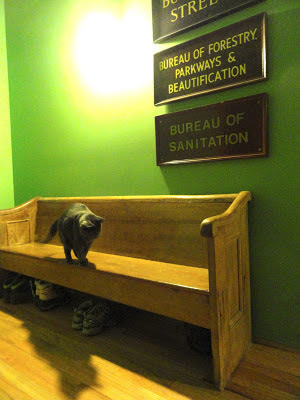 Not sure if Bob will go for my proposed moniker for the newest addition to our home, but I am sort of digging it. 3. A table to offer a catch-all for keys, mail and items that don't need to find a way past our coat closet. About a month ago, Bob came home from church with the idea to purchase one of the old pews the pastor was fixing up and selling. At first I scoffed - it won't look right, it will be too long....but the hallway space between our front door and the second bedroom is a long 105" which leaves an extra 10 inches and upon seeing a photo I deemed the bench "not overly churchy." 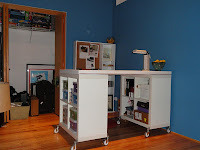 And after a few Pinterest searches, my hopes were built up with photos like this one from houzz.com. Unfortunately, we were low on the list by the time we put our name in the hat with the pastor. Who knew so many people were interested! So we were back to square one. I did a Craigslist search a couple times a week, but the ones pictured were either too pricey (we could have gotten the church's pew for around $150) or looked more like they were from the 80s than a vintage feel (hellooo fabric covered seats!). A Saturday spent at Architectural Artifacts only piqued our interest in having one in our house. Room after room of antique decor, light fixtures, tiles, cars - yes, cars, and what seemed to be at least 50 church pews provided us with hours of strolling and daydreaming. However, the $495 price tag on the pews left something to be desired. I was ready to pull the trigger, Bob shook his head at me. And I'm glad he did because the next day on Craigslist we found the winner! $150 and not too far a drive? "We can pick it up within the hour!" After an uncomfortable ride home with our seats as far forward as the Ford Escape would go to allow us to shut the back door with the whole pew inside, we maneuvered it into the elevator and into the house. The dimensions were perfect. At 74" it is a little shorter than the original pew Bob was looking at so it doesn't quite overtake the whole hallway as it might otherwise have. It comes out to about 22", leaving enough room for the front door to open and not make one feel attacked by furniture the second they are in the door. 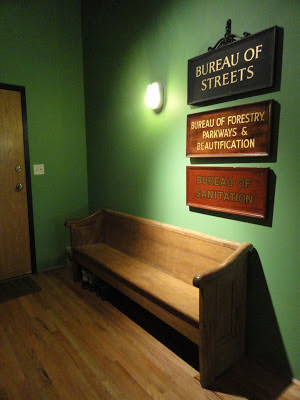 We have plans to clean it up a bit and stain it a darker color to play off of the City of Chicago signs that hang in the hallway, but we'll be waiting until the weather gets a bit warmer to tackle that project! 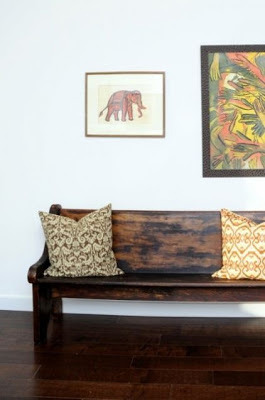 For now, I'll just search for the "perfect pillows" to decorate the bench. 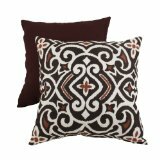 Maybe something like these brown damask pillows on Amazon.com. The cats enjoy their new source of entertainment: in the photo below, Fredo is on the offensive as Sonny hides underneath amongst the shoes.....what a menacing shadow Fredo makes!